Ask The $250/HR Trainer: Help Me Build Triceps That Hook Like A Horseshoe! I train professional athletes, I train A-list celebrities, and now I train you! Get the big horseshoes you want with these routines. Hey Joe! Man, my sleeves are too big. No matter what I try or how I train, I can&apos;t seem to fill them. My biceps have a little peak, but I want my triceps to hook like a big ol&apos; horseshoe. Can you help? You want torched triceps? Elbow extensors that fork like lightning? You bet I can help. Like I stated in my previous article on training the elbow flexors, if you really want big arms, you need to make sure that the majority of your training is based around compound lifts (i.e. dominant movement patterns) like squats (quad-dominant), deadlifts (hip-dominant), chin-ups (vertical pull), inverted rows (horizontal pull), military press (vertical push) and bench press (horizontal push). These movements (and all of their derivatives) will help put overall size on your frame. Once you structure the bulk of your training program around the above movements, you should then add in some exercises that emphasize elbow extensors in a more-targeted manner. 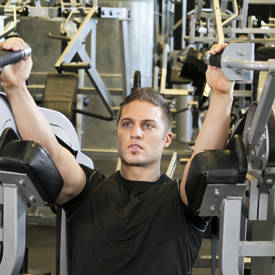 Many people seem to think that, by training the elbow flexors, their arms will get much bigger. They will, to a certain extent, but the reality is that the elbow extensors make up a much larger percentage of the muscle mass on your upper arm. So, essentially, if bigger arms are one of your main training objectives, you should definitely spend some time developing the triceps brachii muscles: the long head, lateral head and medial head. All three heads of the triceps are involved in the extension of the elbow joint, but only the long head crosses both the shoulder and elbow. As a result, the long head plays a role in extending the shoulder joint, as well. Unlike the elbow flexors, the position of the forearm (i.e. pronated, neutral or supinated) has absolutely no bearing on the relative activation of the elbow extensors. Only the long head of the triceps will be affected by the position of the shoulder joint, so in order to emphasize it to a greater degree, we will utilize a couple of exercises where the shoulder joint is in a flexed position (somewhere between 120-180 degrees) relative to the torso. Below, I have mapped out two different 4-week training strategies for incorporating this "Elbow Extensor Specialization Phase" into your current training program. As far as how to incorporate the actual exercises into your daily training routine, I would pair up the A1 movement with an elbow flexor movement (I&apos;ve suggested the sets, reps, tempo and rest period that would work well), then finish off with the B1 & B2 movements as outlined below. Note: TB = Total Body. On the Off days, feel free to incorporate some energy system training (cardio) if you&apos;d like. I always like to give my clients Sundays completely off. Note: LB = Lower Body. UB = Upper Body. On the Off days, feel free to incorporate some energy system training (cardio) if you&apos;d like. I always like to give my clients Sundays completely off. Example: 3110 tempo should take 5 seconds to perform: 3 seconds negative, 1-second pause, 1-second positive and no pause at top. Note: We are putting the long head of the triceps brachii on a stretch and maintaining this position throughout the exercise in order to emphasize it more during the movement.